I hope you are having an exciting Summer. We are in the midst of a 70 degree, sunny, no humidity day in July. Cannot ever remember a July like this year. Feels more like this has been the weather of May, which might be the case for me after spending the healing time in May. I’ve included information on hummingbird. Over the 4th, I got busy potting plants and now have 14 large flower pots adorning our patios. I love the beauty of the flowers. While admiring them, I realized we have hummingbirds this year. The most important aspect of them ignited an awareness that got me moving. Hummingbird suggests that we can do the impossible or immovable or whatever we’ve decided we can’t do. Amazing choices shifted for me as I realized that I can create from what I’ve been unable to embrace. 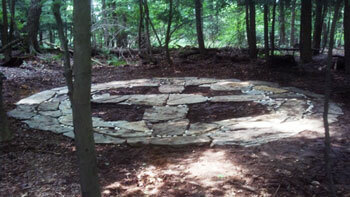 This led me to building a 20 foot in diameter stone medicine wheel. I am praying on it every day. My life is getting more in balance and I feel more energy every day. The upcoming workshops are very exciting. The details are noted below briefly with a link for more details. We have Crystal Awareness in September, Hawk Medicine in October, Four Chambered Heart in December, Shamanic Peacemaking in January, and Vulture Medicine in February. It should be an exciting year. I look forward to seeing everyone at whichever workshop you choose to appear. 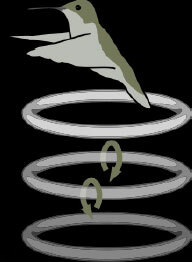 On the left we see that a hummingbird creates a trail of wake vortices generated by its flight. This suggests that it can leave a wake of energy behind its flight. Because of their playfulness, the hummingbirds' wake of energy from its flight reminds us to leave our own wake of playfulness everywhere we go. Furthermore because of this absolutely unique flying ability, hummingbird teaches us that we can accomplish that which seems impossible to others, and do so while finding the miracle of joyful living from our own circumstances.